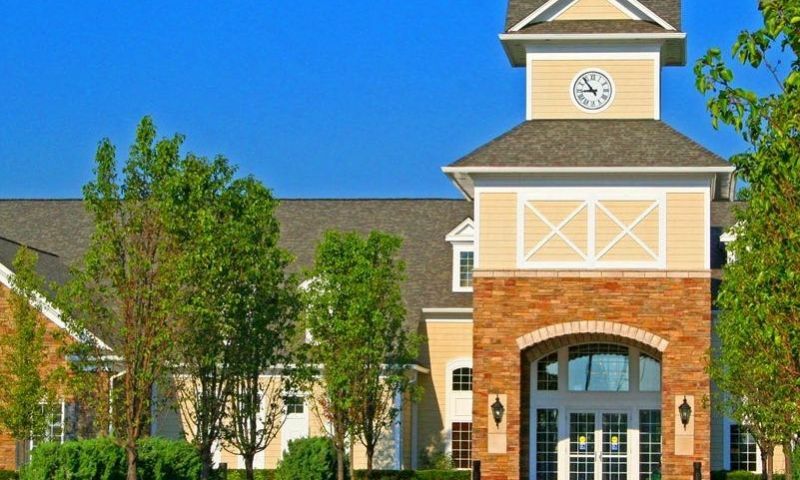 Bridgewater is an active adult community by Del Webb in Brownstown, Michigan. Here, residents can enjoy a clubhouse filled with amenities and a long list of special interest groups and events coordinated by a full-time activities director. This luxurious community designed for residents 55 and better will contain 631 homes upon completion. Bridgewater enjoys a park-like setting that includes picnic areas and a catch-and-release fishing pond. The homeowners' association dues cover lawn care, snow removal, and upkeep of shared sidewalks and walking paths, giving residents more time to enjoy the amenities and the company of neighbors at Bridgewater. Landmark Lodge is a 14,700 square-foot center of activity at Bridgewater that boasts plentiful amenities to keep residents active and social. Residents can work out at the state-of-the-art fitness center while enjoying scenic views of Freedom Park or watching TV. Even the spacious locker rooms feature attention to detail with a spa-like ambiance. The center's fitness equipment consists of resistance machines, free weights, treadmills, elliptical machines and bicycles. Residents can exercise and swim laps in the indoor senior Olympic size pool and rehabilitate in the indoor hot tub. The indoor pool is also used for water aerobics classes and water volleyball. The beautiful Landmark Lodge also provides a card room for joining in on a game of bridge, a multi-purpose room for hosting an event and a library for relaxing with a great new book. The terrific amenities continue outdoors. Bridgewater offers a sparkling outdoor pool with large patio for enjoying the warmer months. There is also plenty of variety when it comes to staying socially active and physically fit with four bocce ball courts, two tennis courts, three pickleball courts, and a horseshoe pit. For a quieter afternoon, residents can take a stroll through the community's ten miles of walking and biking trails or by trying their luck with the fishing pond. Whether barbecuing with neighbors in the pavilion or enjoying a solitary evening in the gazebo, Bridgewater has an amenity to fit every mood. Bridgewater features four home collections by Del Webb: the Manor Collection with six models, the Heritage Collection with six models, the Legacy Collection with four models, and the Classics Collection with five models. Living spaces range from 1,100 to 2,450 square feet. All models are single-family detached homes and have large open floor plans, while several offer optional second floors with optional bedrooms and bathrooms. All floor plans in the Heritage Collection have two bedrooms plus dens, two bathrooms and an attached two or two-and-a-half car garage. The Manor Collection has one to three bedroom models, one-and-a-half to three bathrooms, and an attached two or two-and-a-half car garages. All floor plans in the Legacy Collection have two or three bedrooms with dens, two bathrooms, and two-car garages. Available interior features of ready-to-move-in homes include formal dining areas, walk-in closets, and dual-sink vanities. Since the community handles snow and lawn maintenance, residents have time to enjoy all the amenities of the clubhouse and participate in the community's special interest groups and clubs. Additionally, Bridgewater fosters an environment for engaging in hobbies, pursuing education, and honing skills. The community also provides plenty of opportunities to make friendships and meet personal goals through educational, social, and fitness involvement. Social groups at Bridgewater include book club, gardening group, poker, wine club, road scholar, quilters club and dining group. Special events include tennis socials, outdoor game nights, breakfast bunco, variety shows, and community picnics. The lifestyle director oversees daily activities and a multitude of diverse events geared towards forming friendships between neighbors and enhancing the community spirit. Bridgewater in Brownstown, Michigan is located within twelve miles of the Detroit Metropolitan Wayne County Airport. Brownstown Township is home to three golf courses and residents can find additional courses in nearby Romulus and Riverview. Nearby cities within a 20-mile radius include Ann Arbor, Dearborn and Detroit. Residents of Bridgewater also have easy access to major shopping centers, restaurants, and entertainment. There is also a hospital within three miles of the community. Bridgewater offers everything desired in an active adult community in Brownstown, Michigan. Landmark Lodge - 14,700 Sq. Ft. There are plenty of activities available in Bridgewater. Here is a sample of some of the clubs, activities and classes offered here. The Manor Collection offers six floor plans that range in size from 1,100 to 1,498 square feet. These homes feature one to three bedrooms, one-and-a-half to three bathrooms, and an attached two or two-and-a-half-car garage. This collection is ideal for those who desire a smaller living space without giving up functionality. The Heritage Collections offers a little more living space with homes ranging from 1,539 to 1,900 square feet. There are six models available to choose from. These low-maintenance homes feature two bedrooms, two bathrooms, and a two to two-and-a-half-car garage. All homes also feature a den. The Classics Collection is Del Webb's newest offering at Bridgewater. These homes range in size from approximately 1,600 to nearly 2,300 square feet. They feature two or three bedrooms, two to three-and-a-half bathrooms and an attached two to three-car garage. The Legacy Collection is the largest collection offered in Bridgewater with homes ranging in size from 2,015 to 2,450 square feet. These homes feature two to three bedrooms, plus a den, two bathrooms and two or three-car garage. My husband and I moved into one of the attached units in this community. It is a great place to live and prepare us as we transition to our retirement years. I will be able to leave in the winter without having to worry about my Michigan home. We retired to Florida for five years, but it is just too hot for us. Also, we couldn't stand being away from our family and grandkids. I never thought I would move to a community like this, but I am glad my wife convinced me. The clubhouse and amenities in Bridgewater are out of this world. We feel like we live in a resort. We work out three days a week, swim, and are involved in many activities. We have met some of the nicest people and have become best friends. Living around people our age is really nice. One of the best things about living here is the fact that I don't have to shovel the snow or mow the lawn. Joan and I moved in here to a new house in 2011. We have the Glen Arbor floor plan that has been great. It's a very livable home and the quality is nice, Joan loves it! The lodge is well done with every feature you could need and lots of different activities going on every day. It's nice just being able to head over to the lodge to see what's happening. I always run in to someone I know there!